In India, the ancient festival of Diwali, also known as The Festival of Lights, is undoubtedly its biggest and most important festival. With the desire to teach my young children my own Diwali traditions, we take a trek to our local Little India. Since sweets form such a central part of the celebrations, we spend a lot of time choosing them carefully. Mention the term "holiday season," and what springs to mind are images of traditions, family, celebration and, of course, delicious food. Every country has its own way of celebrating its special days. In India, the ancient festival of Diwali, also known as The Festival of Lights, is undoubtedly its biggest and most important festival. I was fortunate enough to journey home to explore India's culture -- and its kitchens -- in my new cooking show Essence of India, airing Sundays on Canada's Gusto TV. While many of Diwali's sweets remain a part of this chef's repertoire all year long, the holiday -- celebrated in 2014 on Oct. 23 -- has special significance. Diwali marks the beginning of the New Year, the victory of good over evil, light over darkness and knowledge over ignorance. Legend has it that the Indian Goddess of Wealth, Lakshmi walks through each India home, blessing the home with wealth and prosperity. In India, it's celebrated with great pomp and style by hundreds of millions of people across the country. New clothes are bought, sweets and gifts are exchanged, family travel distances to meet each other and when the sun sets, fire crackers and fire works light up the evening sky. At night, we light our homes with Diyas, little oil lamps that are strategically at the entrance of the house. Homes are cleaned and tidied, to please the Goddess Lakshmi, and hundreds of little lamps called Diyas are lit to welcome her to the house at night. Sweets are left out in front of a small deity version of the Goddess with the expectations that she will eat them, and bless the homes with joy, health and prosperity. Living in North America, I have learned to adapt my Diwali traditions. With the desire to teach my young children my own Diwali traditions, we take a trek to our local Little India. For me, that's on Lexington Avenue in Manhattan, New York City. Most large metropolitan cities in North America boast of a Little India, which are usually a few bustling and vibrant streets, lined with Indian restaurants, grocery stores and ornate clothing stores. We meander through the colorful stores on Lexington Avenue, picking up sweets and new clothing, usually Indian clothes in silks, decorated with gold thread and sequins. Since sweets form such a central part of the celebrations, we spend a lot of time choosing them carefully. Mithais are a form of Indian candy, and come in gorgeous boxes, and are loved by all. There are chocolate, vanilla, cardamom, nutty varieties. Some are hard and chewy like toffee, others are soft and silky and melt in one's mouth. Filming Essence of India reminded me of the delightful and extraordinary variety of Indian sweets. I immersed myself in all Delhi had to offer, losing myself in the sensual pleasures of sampling rich Indian desserts. I reminisced on my childhood, by visiting my favorite Kulfi place which settles on a winding little lane in Old Delhi, where varieties of the rich Indian ice cream extend from Rose to Pistachio to Mango are considered the norm. I also try some delicious Indian funnel cakes known as Jalebis, and sample the many varieties of mithai, which are a very important part of the Diwali celebration. Another incredible Indian dessert, the Kheer or Indian rice pudding, is also jazzed up during Diwali, by adding saffron, and dried fruits and nuts. For those with allergies, using fresh apples and pears are options, that make for a fabulous culinary experience. 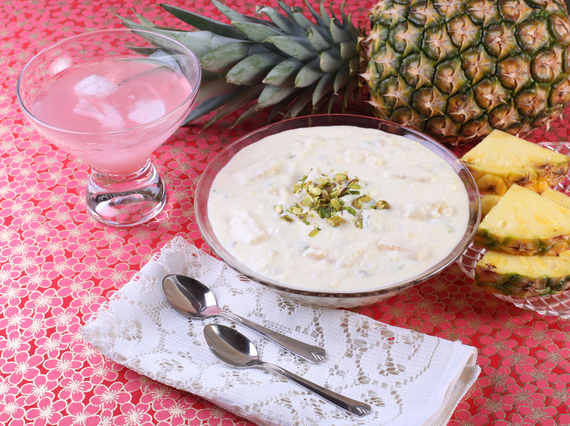 Kheer is an ever popular sweet dish that is eaten during Diwali, the Festival of Lights. In India rice kheer is the most popular although one can also use fine noodles. In Canada, one can use the regular vermicelli noodles available at any grocery stores. It's a very popular Diwali recipe across India. 1. Boil fresh milk in a heavy bottomed pan. 2. Add rice or vermicelli noodles to the milk and mix. 3. Cook on a low flame till the rice grains turn soft and begin to break. 4. Now add cardamom powder to the rice-milk mixture and stir well. 5. Keeping the slow flame, mix in the sweetened condensed milk into the pan and stir thoroughly. 6. Simmer for another 4-7 minutes. Remove from fire and pour kheer into a serving bowl. During Diwali, pretty silver bowls are used, or decorated bowls to add to the festivities.